The Public Health Leadership Competency Network hosted a webinar in February 2019 to share a knowledge transfer strategy focusing on leadership within public health practice . In 2015 Leadership Competencies for Public Health Practice in Canada were released, founded on the premise that leadership competencies can be used strategically to integrate leader roles and behaviors into an organization’s culture, systems, processes and technologies. Toronto Public Health implemented a Growing Leadership initiative based on the Leadership Competencies. The purpose of the initiative is to increase the knowledge, skill and capacity of public health practitioners related to the leadership competencies within their role functions. Growing Leadership uses the competencies to enable staff to build their leadership capacity through the development of a deliverable outcome that can be embedded into their current work. Evaluation has demonstrated the success of the initiative and enabled program improvements. · hear from participants about their experience. You can access the recording of this webinar on YouTube. This webinar will highlight the findings of a scoping review of the literature that was guided by the research question "What aspects of public health leadership to advance health equity have been considered by research?” Public health leadership to advance health equity occurs at community, organizational and societal levels, and it helps shape internal and external environments within which public health functions. This webinar provides a useful description of leadership as well as tools, strategies and mechanisms that will help you with policy development, practice, education and research. This webinar can also help support public health leadership competence at individual, organizational, community and system levels. Brenda Lammi, MSc, BSc (OT), BPHE, BA (Hlth), Director, LEADS Canada. This presentation focuses on the development of leadership competencies for public health practice and detail the key themes related to each. An overview of LEADS is also provided. The key to continual development of one’s leadership capabilities includes looking at one’s growth mindset, which can be broadly defined as the ability to continually learn and grow by seeking new experiences. This presentation will share new practices that are gaining much ground and momentum in the field of leadership development. This 1.5 hour course is conveniently priced at $99.99 + applicable taxes. CIIAN is offering CHNC members a chance to take this training at a reduced rate of 50% off for the rest of 2018. In order to be registered at this reduced rate, forward this e-mail announcing this training opportunity (or other proof of CHNC membership) to ciian@ciian.org and request to be registered in the course. The Alberta Family Wellness Initiative (AFWI) has developed an online course to make Brain Story science available to professionals and the public. Brain Story Certification is designed for those seeking a deeper understanding of brain development and its consequences for lifelong health. The Brain Story synthesizes decades of research and reflects a body of knowledge that experts agree is useful for policy-makers and citizens to understand. McMaster University, together with Health Canada, the Ontario College of Family Physicians and the Clean Air Partnership, have designed a free, accredited program, Radon: Is it in your patients’ home?, in order to provide you and your colleagues with reliable, evidence-based information. The course is accredited for Continuing Medical Education credit by the College of Family Physicians of Canada (1 Mainpro-M1 credit) and the Royal College of Physicians and Surgeons of Canada (1.0 hours). The Professional Specialization Certificate in Population Health Data Analysis is a fully online, certificate program in Population Health Data Analysis (PHDA) offered through a partnership between Population Data BC and the UVic Division of Continuing Studies and Department of Geography https://www.popdata.bc.ca/etu/. PHDA program and respective courses are designed to serve the needs of health professionals, analysts, policy makers and researchers who are seeking education and professional development in advanced population health analysis. Individuals can enroll in the full certificate program or take up to two courses for professional development. One of the courses that may be of particular interest to those in the nursing profession is our Population Health and GIS course - This health geomatics course includes a balance of theory and practical work. Have you been looking for online Professional Development opportunities? Apply now for the Professional Specialization Certificate in Population Health Data Analysis or take up to two stand-alone courses for professional development. These fully online, non-credit courses—offered in partnership with the University of Victoria, Division of Continuing Studies and the Department of Geography—will give you the skills and knowledge you need to get ahead in your career. As Canada’s source for HIV and hepatitis C information, CATIE delivers free webinars on a range of topics of interest to public health practitioners across the country. Browse our upcoming webinars below and register on the CATIE website. Olivier Bellefleur and Michael Keeling from the NCCHPP presented a webinar entitled ''Introduction to Public Health Ethics'' on December 16, 2014. This interactive presentation visited some of the vast field of ethics by examining how certain theories, approaches, principles and frameworks in public health ethics can have diverse implications. The Public Health Agency of Canada (PHAC) offers an archive of webinar presentations on emerging public health issues free of charge. Click here to view archived webinar presentations. IPAC Canada has launched its Infection Prevention and Control Program for Front Line HealthCare Workers, new for 2018. This comprehensive English and French self-paced, online learning program is designed to help implement standardized infection prevention and control practices while reducing the number, duration and severity of infections in any healthcare setting. Click here for more details. The Simon Fraser University's Department of Biomedical Physiology and Kinesiology are running an exciting online course on Prevention and Management of Cardiovascular Disease that is targeted to health professionals who may encounter patients with cardiovascular disease (CVD). The registration is open to health care professionals from varying fields (nurses, dietitians, exercise professionals, social workers, psychologists, pharmacists, etc.) who wish to better their understanding of managing patients within and outside of their discipline. The course has been designed by health-care professionals at St. Paul’s Hospital’s Healthy Heart Program in Vancouver and will provide participants a broad base knowledge of CVD to help in their day-to-day patient management. Core concepts that will be emphasized in the course include disease pathology, diagnosis, patient risk assessment, behavioural change, lifestyle modification and management. For more information or for registration please click here. The Health Promotion Seminar Series is a collaborative effort between the de Souza Institute and the Community Health Nurses Initiatives Group (CHNIG). The seminars offer an opportunity for professional development to nurses working in all domains of practice; community or acute care. Topics are focused on current issues, and provide a means for knowledge transfer, discussion, and resources to apply to practice. The monthly seminars are free of charge and open to all nurses. They are typically held on the third Thursday of the month from 12-1pm EST. Past presentations were very successful and covered the topics of Smoking Cessation, the Aging at Home Strategy, Chronic Disease Prevention, Cultural Safety, Primary Health Care, Political Action, Youth Engagement and the Social Determinants of Health. De Souza Institute, an oncolog continuing education centre, has recently announced that its courses are now available to all nurses across Canada. Courses are designed for any nurse that cares for cancer or palliative care patients, in any setting. Primarily online, course include: Advance Care Planning, Education in Palliative and End-of-Life Care, Psychosocial Care, Sexual Health and Cancer, Managing Grief and Loss, Patient Teaching and Education, Introduction to Hospice Palliative Care and more. de Souza Institute is very pleased to partner with the Faculty of Nursing at the University of Windsor to offer the Graduate Diploma in Oncology/Palliative Care Program. We have revised the admission criteria to open this program to health care professionals with a completed health-care related undergraduate honour degree and a minimum of two years' experience in a health-related field. We welcome applications from health care professionals, including nurses, physicians, physician's assistants, physiotherapists, dentists, social workers, psychologists, etc. This program is designed to help health care professionals meet the challenges associated with working with oncology and palliative care patients. The online delivery allows this program to be accessible to students across Canada and potentially worldwide. An additional simulation component will take place on-site at the Faculty of Nursing’s state-of-the-art, newly expanded facilities in Windsor, Ontario, Canada. We encourage you to review the program details and application information by clicking here. CHNET-Works! is a networking venue dedicated to linking researchers, decision-makers and practitioners in population health and stakeholder sectors from across Canada and hosted by the Population Health Improvement Research Network at the University of Ottawa. Partnership involves provincial, territorial and national organizations with a focus in two streams: continuing education and mobilizing the network to action. Click here to read more information about CHNET-Works! and access the blog, newsletter and Fireside CHATS. Interested in building your knowledge and skills in program evaluation? 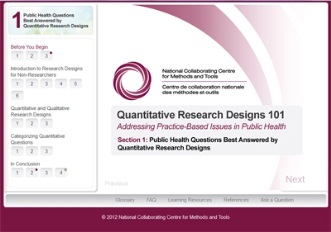 Check out the Canadian Institutes of Health Research's online module! This online module has been developed to support practitioners, managers and researchers in the evaluation of health and health research initiatives (including knowledge translation). A key aim of this module is to develop capacity to conduct evaluation to support evidence-informed action. Take one of the free online courses at AllergyAware.ca to increase your knowledge about allergies and anaphylaxis in the community, schools and child care settings. The 30-minute courses cover the basics of anaphylaxis, ways to reduce risks, and what to do in an emergency. Upon completing a course and passing the short quiz at the end, you will receive a personalized Certificate of Completion. The courses have been medically reviewed, are mobile-friendly so you can take them at your convenience, and are available in English and French. The courses were developed by Food Allergy Canada and Leap Learning Technologies Inc. in collaboration with the Canadian Society of Allergy and Clinical Immunology.